One of the most common questions we get asked here at Witches Falls Cottages is 'where are the best places to eat and enjoy a drink'? We know ourselves how important it is to find the right eating or drinking spot to make your stay on Tamborine Mountain into a complete experience. On Tamborine Mountain we are very fortunate that there is a wide variety of Restaurants and different cuisines available. Some of them are in walking distance to your cottage at Witches Falls Cottages and others are just a short drive away. International tastes are truly diversely catered for. Let's see now we have American, Chinese, French, German, Greek, Indian, Italian, Irish, Japanese, Polish, Thai and of course Australian restaurants dotting the mountain landscape. With so many different choices to choose from you will no doubt find the perfect place to wine and dine the day or evening away. Experience and enjoy truly amazing food, special local and Queensland wines, boutique beers and out of the ordinary award winning liquers (all within easy distance of your Witches Falls Cottage). Come stay for a few days or more and you could try them all! Click on the symbols on the right hand side of the map below for an overview of all restaurants, wineries, distillery, breweries, coffee shops and even the markets. ... this map is very much work in progress... we thank you for your patience as we continue to update and add to the information below. We do take great care with checking the opening hours and are in contact with all the businesses listed below on a regular basis to ensure the details provided are correct. Opening hours can change on a short notice, a business may be closed because of a private function.... PLEASE DO MAKE A BOOKING AT THE RESTAURANT OF YOUR CHOICE ESPECIALLY IF YOU ARE PLANNING ON GOING OUT FOR DINNER! We do provide the phone number for the purpose. Staying at your Tamborine Mountain accommodation you may like to explore further and visit Byron Bay for a day trip. In addition to the pdf of our 'Country Drive to Byron Bay' (pdf is available to print from our website or take a copy from your folder in your cottage) we recommend that you take a street map, which we also have available at Witches Falls Cottages, and download or print the Google Map for the Country Drive to Byron Bay. We pride ourselves to have THE BEST location on Tamborine Mountain. For your culinary delights you have countless lunch venues within walking distance including Mason Wines which offers a most delicious, seasonal menu or walk to the village where you find an array of different cuisines on offer. If you are celebrating a special occasion or looking for a relaxed venue for dinner you will be able to find a suitable restaurant within walking distance or a short drive from your cottage. At Witches Falls Cottages we offer private accommodation for couples. Each of our cottages has a big double spa in the bathroom with that special outdoor feel created by a glass roof and glass sliding doors, a fireplace (seasonal) and a private outdoor area with a covered BBQ. We deliver your choice of Breakfast Hamper to your cottage each morning. Please contact Daniela & David on 07 5545 4411 or visit our accommodation choices page if you would like any further information. Amore B&B offers a traditional bed & breakfast experience with 4 intimate and elegant rooms. Please contact Kay & John at Amore B&B on 07 5545 2330 or visit the website if you would like any further information. 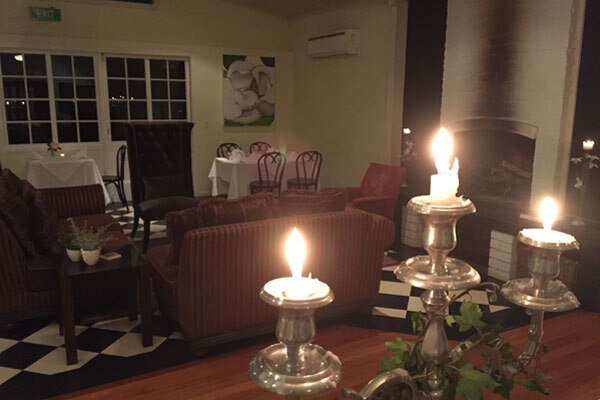 Coming up to Tamborine Mountain for a weekend or romantic getaway you are spoiled for choice of different cuisines and flavours on offer whether you like to go out for lunch or dinner or both! 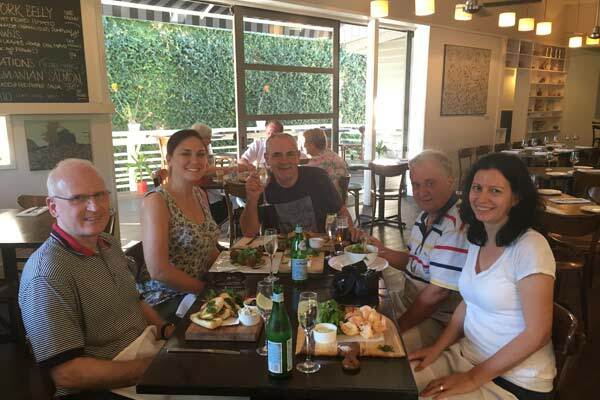 Dining out is an important part of your overall experience of Tamborine Mountain and there is a restaurant for every occasion. Enjoy beautifully presented fine cuisine in a romantic setting, or go to the local pub where you can enjoy a beer and hearty meal in casual surrounds, try some Polish, Japanese, Indian, Chinese, French, Thai, Mediterranean or Italian specialties or stay in and get a takeaway meal to enjoy in your own private outdoor dining area or in front of the fire during the cooler winter months. Staying at Witches Falls Cottages you can walk to some of the restaurants and from your cottage there is a foot path along Main Western Road which leads you to Main Street of North Tamborine. There is also a foot path along Hartley Road which leads to Mason Wines & Cedar Creek Estate for a lovely lunch with a glass of wine. Italian born Mario services up wood fired pizzas, pastas and other italian cuisine. The Belvedere Restaurant is open 7 days for Lunch and Dinner. Click on this link to view the dine in and the takeaway menu. The Restaurant at Cedar Creek Estate Winery is open 7 days for Lunch and Daniela & David enjoy the lovely outdoor setting near the lake when they visit for a meal. You find the current A la Carte Restaurant Menu on the Cedar Creek Estate website. Great food! Great drinks! Great Craic! Try something off their traditional dinner menu. Daniela & David will always start their meals with a serve of crisp potatoe skins and for mains it is a toss up between the traditional Irish Stew, Beef & Guiness pie or the 'Match made in heaven' bangers and mash with an extra serve of the yummy gravy for Daniela! Make sure to book a table if you like to eat at Clancy's. During winter Daniela & David love to sit inside in front of the fire and during the less cooler months they choose the outdoor area. If you visit on a Friday or Saturday night or Sunday afternoon you enjoy the irish live music played by owner Martin and his friends. You find attached a pdf sample of the menu. but please note that the seasonal menu does change on a regular basis. At Drift you can choose if you like to sit in the cafe, on the huge deck overlooking Doughty park or in the burger bar out the back. Drift Cafe is open 7 days from 7.00am to 5pm. The Restaurant is open 7 days for lunch until 3.00pm. Click on this link to view the Drift menu. The covered veranda overlooking the gardens is where Daniela & David like to sit on a nice sunny day and enjoy one of Chef Dylan's creations. The shared platters are divine and if you are looking for something light you cannot go past the superfood salads. Desserts are beautifully presented and absolutely delicious. The Eden Restaurant is open for lunch service 7 days from 11am to 3pm. Click here for a link to Chef Dylan's seasonal menu. Slow cooked meats. Fine wines and beverages. Hickory is a 'trendy' new venue on the Mountain. Specializing in slow cooked meats, the ribs are their signature dish. Heading out for a nice meal in North Tamborine, Hickory with its extensive cocktail and beverage selection is also ideal for a pre or after dinner drink. Click on the link to view Hickory's menu. The Leaf Restaurant offers an intimate dinning experience at their small venue or offer takeaway if you prefer to stay in. The Restaurant is open Wednesday to Monday for lunch and dinner. The Leaf Japanese Restaurant does not have a website but you find the menu on their facebook page. The Three Little Pigs is one of the Restaurants with a fireplace which makes for a cozy dining experience in winter. During the warmer summer months there is a shaded outdoor area where David and Daniela like to sit and enjoy their favourite from the menu, the salt and pepper prawns! For more information please have a look on the Eagle Thai website. The Fox & Hounds Country Inn is the Gold Coast's only authentic English Pub, and the only pub in Australia to have actually been transported from England! You cannot miss the landmark red telephone cabine at the turn off! If you are looking for a cold beverage like a British Ale or sample traditional pub fare like Toad in a Hole, Yorkshire Pudding or Guniess Pie, you will feel like you are in England visiting an English Pub. This is the only restaurant on Tamborine Mountain where you don't need to make a booking! You may be familiar with this popular Seafood Outlet from one of their other locations at Sanctuary Cove, Coolangatta or Brisbane. You find the menu on the website of George's Paragon. Visit the elegant venue at the Corner of Shelf & Bartle Road for your wine tasting experience and a look at the magnificent building. The Restaurant there is open daily for lunch 11.30am – 3pm and the stone fireplace provides a warm and cosy atmosphere for dining during the winter months. Hilltop on Tamborine is a licensed cafe/ restaurant and art gallery with sweeping coastal views over the trees. The quirky menu has influenced by the Scandinavian heritage of the family run business. You find the lunch menu on the website as well as information about the exhibitions at lunch menu which change regularly. Open Monday to Thursday 10am -5pm. Friday/Saturday 9pm. Masala Shanti is an authentic Indian experience and one of the best Indian Restaurants you will find in Queensland. 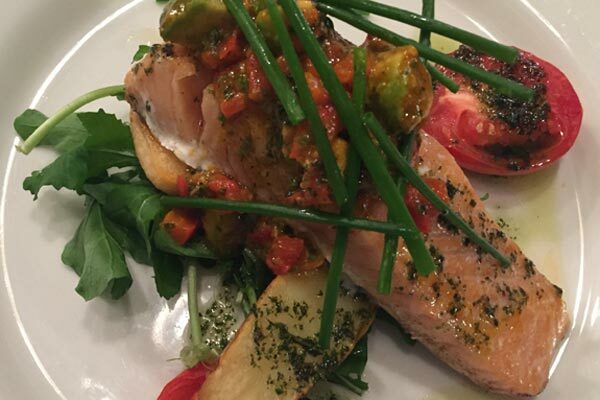 The restaurant is family owned and takes great pride in the use of fresh ingredients and the delicious food. To view the Menu please have a look on Masla Shanti's website. Award winning Modern Australian Restaurant in a lush Rainforest setting. Have a look on Songbird's seasonal menu. The Old Church Restaurant features as Modern Australian cuisine with Italian influence and is one of our top recommendations for guests celebrating a special occassion. The Restaurant is in a beautiful setting with an open fireplace indoors. Adjacent is the old church, a pretty little chapel, perfect for a romantic wedding. Chef Andrew Quarantini spoils his guests with an exquisite menu and The Old Church Restaurant is one of David and Daniela's favourite dinner places. If you talk to David he will tell you that you MUST have the Sticky Date Pudding for dessert! Open for dinner on Thursday, Friday, Saturday and Monday from 5.30pm. Lunch from 11.30am on Friday & Sunday only. Andrew sources the best and freshest produce for his dishes. Have a look on the menu. Lunch is available at the Terrace Kiosk 7 days from 10am. Dinner is available at the Rainforest Grill on Friday & Saturday evening from 6pm. Due to unforseen circumstances the iconic Polish Place is closed until further notice. Location, Location, Location... we cannot emphasise it too much... from your cottage at Witches Falls you can walk to three of the wineries on Tamborine Mountain! A little tip... in the occasion that you cannot resist the temptation and end up buying more than just a couple of bottles at one of the cellar doors... dont fret you dont have to carry it all back to your cottage, if you mention that you stay with us at Witches Falls Cottages the friendly staff will deliver it to reception at the end of their day marked with your cottage number! Cedar Creek Estate Winery and the Queensland Wine Centre are open 7 days from 10am till 4pm for wine tasting except on Christmas Day and on Good Friday when the Winery is closed. On Anzac Day the Cellar Door stays closed until 1pm but the Restaurant opens as usual from 10am and is permitted to serve Alcohol with all main meals. You do not need to book in advance for the wine tasting but there is a small charge for the tasting. You find more information on the Cedar Creek Estate website. Wine Tasting at Mason on Tamborine Mountain is open daily from 10am to 4pm. We recommend that you combine your visit with a lovely lunch at the Eden Restaurant at Mason which serves lunch from 11am to 3pm daily. For Mason's wine list please have a look on the website. Visitors to Witches Falls Winery have the opportunity to taste extensive wine range from 10am – 4pm on Monday till Friday and 10am – 5pm on Saturday & Sunday. Witches Falls is a producing winery and during season you can see Jon Heslop and his team in action through the large glass windows behind the wine tasting counter. Wine connoisseurs may be interested to know that Witches Falls Winery has been awarded 5 RED stars by James Halliday, Australia's most respected wine critic! Staying at Witches Falls Cottages don't forget to pick up a voucher for a free wine tasting session for two from our reception. Witches Falls Winery is the third of the local cellar doors within walking distance and only a short stroll of 450 meters from your cottage. There is no restaurant at Witches Falls Winery but take advantage of the picnic rugs available and spread through the garden to relax and enjoy a glass of wine. Witches Falls Winery offers a range of Reds, Whites and Dessert wines which you find listed on their website. Albert River Winery is a scenic 21 minutes drive via Tamborine Village, nestled at the base of Tamborine Mountain. Coming up the driveway take a minute to stop and take a picture of the idyllic setting and the grand Queenslander which was once a Brisbane landmark. The iconic Queenslander, "Auchenflower House" is well worth the drive. The magnificent historical home, which was home to three former Queensland Premiers, has been elegantly restored. The Cellar Doors and Tasting Area are located in the former Auchenflower House Billiard Room and the Vineyard Restaurant is is located on the sweeping verandah from where you overlook the lush green valley of vines with the stunning backdrop of Tamborine Mountain. Heritage Wines offer two tasting venues which are both open from 10am to 4pm. You find the second wine tasting outlet in Gallery walk near the Fig Three round about. The Restaurant and Cellar Door are open from 8.30am to 4pm. Tamborine Mountain Distillery is Australia's most internationally-awarded distillery and liquor brand. A visit to the Distillery is an experience in itself. Daniela loves the building complex as they style of architecture reminds her of Europe, David is more drawn to the tasting area where you find an array of Liqueurs, Schnapps, Vodka and Eaux de Vie. Filled into pretty pretty painted bottles the delicious drops make great presents too! The Distillery is open from Monday to Saturday from 10am till 3pm. On Sundays when the Distillery is closed you can taste and purchase the products at the Eagle Heights Hotel or at Cedar Creek Lodges/ Thunderbird Park. Cellar Doors are closed on Good Friday, Christmas Day and until 1pm on Anzac Day. At the Cellar Door you find two labels on offer, both with their own range of boutique, craft beers. Choose between the Fortitude Brewing Co. and the Noisy Minor range or get a tasting plate with 6 different strengths and flavours of beers. Set in a Tudor-style building, the cosy hotel is a landmark in the small country town of Canungra. The Bistro is open 7 days a week for lunch and dinner if you wish to accompany your cold beverage with something to eat. Great food! Great drinks! Dont miss out and book a table if you like to eat at Clancy's. During the cooler winter months the best tables are inside, close to the fire place. On a balmy summers evening Daniela & David love to sit in the outdoor area. Irish born Martin and his wife Natalie own Clancy's and Martin plays irish music at Clancy's on Friday & Saturday nights and Sunday afternoons. Enjoy a lazy afternoon, relax in the beer garden and take in the stunning views of the Gold Coast skyline with live music every weekend. The Tavern is located in Tamborine Village at the foothills of Tamborine Mountain. At the Bearded Dragon you can expect a traditional australian pub fare - a true blue Australian experience. There are a reptile & crocodile show three times a week and cane toad racing on Sundays, as well as 15 cold beers on tap! Opening hours for lunch and dinner are from 10.30am till 8pm on weekdays and 11am till 8pm on weekends. Elevations Cafe is located next to the Newsagents and IGA and open 7 days from 7.30am to 3pm. The Mountain Brew Coffee Shop is located in the middle of Main Street and is open 7 days from 7am to 5pm. Set in an enchanting garden and with a Rainforest backdrop, Tea & Niceties offers an elegant High Tea experience in the Tearoom or a casual and relaxed lunch or Devonshire Tea on the deck. The Tearoom is open on Fridays and a 2 hour sitting can be booked to start anytime from 11am and 12noon. On Saturday and Sunday the Tearoom is open from 10am to 3pm, again for 2 hour sittings. The Cafe is open Wednesday to Friday from 9am to 3pm and Saturday & Sunday from 9am to 4pm. Make sure to book a table if you like to eat at Clancy's. During winter Daniela & David love to sit inside in front of the fire and during the less cooler months they choose the outdoor area. Dinner Thursday – Saturday 6 – 8pm. Bookings essential are essential. Please phone between 9am and 5pm. You find a link to the Menu on Pethers website. Coming up the driveway take a minute to stop and take a picture of the idyllic setting and the grand Queenslander which was once a Brisbane landmark. The iconic Queenslander, "Auchenflower House" is well worth the drive. The magnificent historical home, which was home to three former Queensland Premiers, has been elegantly restored. the Vineyard Restaurant is is located on the sweeping verandah from where you overlook the lush green valley of vines with the stunning backdrop of Tamborine Mountain. Just got engaged? Albert River Wines offers a choice of ceremony locations where you can pledge your love surrounded by the beautiful ambience of the winery. For more details please have a look on the Albert River Wines website. Located on Gallery Walk the Mount Tamborine Vineyard & Winery enjoys a premium position. The premises are open daily from 8.30am to 4pm. Along with the Cellar Doors where you can sample the range of red, white and fortifies wines, the Restaurant which services lunch, you find 'Mountain House'. Mountain House offer locally made products, trend homewares, beauty products and jewellery. If you are exploring the Canungra Valley or head up to O'Reillys for a day trip you may want to stop at O'Reilly's Canungra Valley Vineyards. Sample some of the wines and explore the extensive grounds stretching along the Canungra Creek. The homestead is also home to the Vintage Restaurant which is open for lunch every Friday, Saturday and Sunday. "The influence of Chinese food in Australia began in the goldrushes of the 1850’s and 1860’s, when the first organised groups of Chinese came to Australia in search of gold. Because of the number of Chinese people who came to Australia to find gold, Chinese immigrants also opened Chinese restaurants that served traditional dishes for themselves and for the locals. By 1890, it was said that one-third of all the cooks in Australia were Chinese. Chinese food has become very popular in Australia over the past few decades. Chinese restaurants in Australia used to offer only very basic Chinese dishes. But today there is usually much more to choose from. Most Chinese food is very healthy and includes all the ingredients for a balanced diet. Two of the most important ingredients in Chinese dishes are rice and noodles. Noodles were invented by the Chinese. The Chinese also invented chopsticks, based on the idea that instruments used for killing should be banned from the dinner table. Therefore, knives are not allowed, and that is why Chinese food is always chopped into small pieces before it is served. Today fried rice, chow mein noodles and spring rolls are a common part of the diet of most Australians. Other common Chinese foods eaten in Australia include Sweet and Sour Pork, Peking Duck, Mongolian Beef, and fortune cookies! But the Chinese have not only influenced the type of food we eat, but also the way we cook (most Australian families would have a wok in their kitchen and bamboo steamers are also becoming common), and the way we eat (for example, Chinese banquets)." Recently opened The Mountain Top Chinese & Japanese Cuisine offers a range of Cantonese-style Chinese and Japanese food including the mountain's only Japanese Sushi Train. The Restaurant is BYO and you can dine in or get a take away. Opening hours are Tuesday to Sunday from 11am til 8pm.